All roads lead to Rome. Or wait…on this vacation they lead to Venice as well, so you can enjoy two of Italy’s captivating cities. You won’t travel between the cities on a road, though. We’ve arranged for you to travel via high-speed train from Rome to Venice. We’ve also arranged three nights hotel reservations in each city, guided sightseeing, buffet breakfast daily, transfers to/from your hotels, to/from the train stations, and the services of a Local Host® in each city, a “friend” who will help answer questions, offer suggestions and help you get the most out of your vacation. Your first Local Host will meet you upon your arrival at your Rome hotel, present you with materials on the city, answer any questions, and help you get started on your vacation immediately. This friend-in-the-city will also help you personalize your trip. The next day, enjoy included buffet breakfast before we pick you up for exclusive Monograms sightseeing with a local expert. 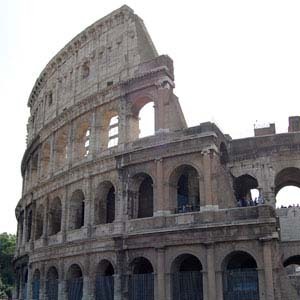 History comes alive as you hear the insider stories and visit the sights you’ve heard so much about-the mighty Colosseum, the amphitheater used for deadly gladiatorial contests; the Roman Forum, the political, social, and commercial center during the Roman Empire; Sistine Chapel, where you will view Michelangelo’s The Last Judgment; and St. Peter’s Church and Basilica, the very church where the Pope often presides. In Venice, your sightseeing with a local expert includes the sights you cannot leave Venice without seeing-St Mark’s Square and Basilica, Doges’ Palace, and the Bridge of Sighs. In both cities, your inside visits include VIP access, so you get to skip the lines! Why spend your vacation waiting in line with all the other tourists when you can spend your time gazing at the famous works of art and imagining what it was like to live in the Roman Empire? In both cities, you’ll also have plenty of time to explore on your own. Perhaps take a tour of Rome’s catacombs; walk through Villa Borghese; or visit Harry’s Bar in Venice, a favorite hangout of Hemingway’s. Maybe enjoy a Vivaldi concert in Venice or a ghost walking tour in Venice & Rome. In both cities, you’ll have many opportunities to make your vacation memorable! Your Local Hosts can give you suggestions and also arrange activities for you. Also, be sure to ask them for the best picture spots!